Craft beer bars are the latest in-thing, if signs in the F&B scene are anything to go by. Since Hidden Door Concepts opened gastrobar NickelDime Drafthouse last year and started their dedicated 15 craft beer taps flowing, word in the industry was that there would be more coming in 2015. The first of these to open this year is Druggists with a whopping 23 taps, starting what may be a craft beer tap version of a nuclear arms race. Located in the quickly gentrifying area of Jalan Besar just a stone’s throw away from third wave coffee pioneer Chye Seng Huat Hardware, newly opened Druggists is actually started by the same people behind craft beer importer The Drinking Partners, who handle cult and distribute beer brands such as Mikkeller and To Øl from Denmark, Prairie Artisan Ales and Magic Hat from the United States, UK’s Thornbridge as well as a slew of Belgian marques such as Trappistes Rochefort, Delirium, Orval and Westmalle. As such you can expect to see many wild and interesting beers from these brands on tap. Druggists gets its name from the Chinese Druggists Association, from which it leases its space. 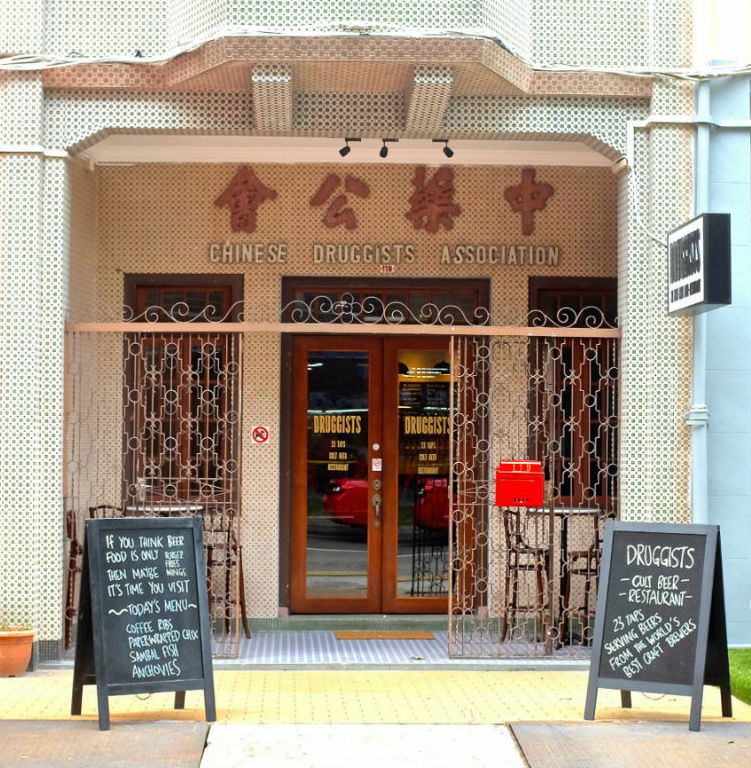 In fact, once in a while as you’re partaking from your favourite Belgian-style sour ale you may spy elderly Chinese women or gentlemen meandering through the tables of the old-school kopitiam inspired space looking for the stairs to get to the second floor of the shophouse, where their headquarters is still located. “We’ve been planning something like this for many years, but it has been a challenge looking for the right space,” reveals Corrine Chia, a partner at The Drinking Partners. “Having this rotating range of beers on tap allows us to better support our principals (brands), helping expose their beers to consumers and hopefully driving up beer sales volume for them,” Chia adds. Beers here cost around $5-15 for a 250ml pour, and can run up to over $20 for a 500ml serve of the biggest, high-ABV beers – like the 17.5% ABV Mikkeller Black – available in the country. But that’s still a very affordable price, rather comparable to the prices at Mikkeller Bar in San Francisco or even the one in Bangkok. A tiny kitchen churns out beer-friendly finger food, such as the likes of coffee-flavoured ribs and sambal anchovies, carefully curated by Chia and her husband Lincoln Goh to pair with the beers on offer. Judging by the evening crowds, Druggists today looks like the darling of the craft beer scene. But the pair is aware they can’t rest on their laurels; they know of a few more craft beer bars that are opening very soon… including one that is rumoured to boast 30 taps. Druggists is located at 119 Tyrwhitt Road.